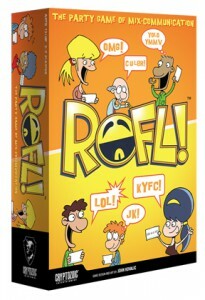 My new game – ‘ROFL!’ from Cryptozoic! I’ve been working on four big projects, which I’ve had to be a bit quiet about, until they were announced. HERE IS THE FIRST ANNOUNCEMENT! My new party game will be out soon. MY. NEW. GAME! From Crypto-freaking-zoic! I’m incredibly proud of ROFL! Indeed, I am Kermit Flail Arms Happy about this design! I’ve pretty much taken everything I’ve learned from all the party games I’ve worked on, from Apples to Apples to Faux*cabulary, and distilled it all for ROFL! The actual ROFL! game mechanic is something I think is unique, and from tons of play testing, people seem to love it. And working with a great company like Cryptozoic? HOLY CATS, what an honor and a thrill! Irvine, CA (January 8, 2012) — Cryptozoic Entertainment™, the premier developer of original and licensed games including The Walking Dead Board Game and Hot Rod Creeps, is proud to partner with John Kovalic, one of the minds behind “Apples to Apples” and the pen behind the hilarious Munchkin illustrations, for ROFL! Wild and quick to play, ROFL! is a hilarious party game of mix-communications sure to delight gamers of all levels. Players battle it out, trying to condense well-known phrases, and have the Guesser decipher the message, as quickly as they can! To start a game of ROFL!, players see a phrase card, while the Guesser does not. Players compete with one another to accurately relay the secret message on the phrase card in as few characters as possible. Everybody gets to be a Guesser once per round. Whoever scores the most points at the end of three rounds wins! ROFL! is a lively game of crazy phrases and wild guesses, perfect for three to seven players, ages 12 and up. It only takes a few minutes to learn, and plays in half an hour or less, making ROFL! perfect for parties and other social gatherings. ROFL! comes complete with 170 phrase cards, a card holder, seven colored tokens, seven colored dry-erase boards, seven dry-erase markers, a game board, 56 scoring chips, a rules sheet and a timer. Plus, ROFL! includes 5 blank cards so players can add their own phrases to the game. Finally, the high quality, reusable components mean less pencil and paper waste than other games. ROFL! will be available in hobby stores nationwide in spring 2013, at a suggested retail price of $35.00. Please visit www.cryptozoic.com for more information on ROFL!, and keep up to date with exclusive contests, promotions and game information on Cryptozoic Entertainment’s Facebook and Twitter pages. John Kovalic is an award-winning, best-selling cartoonist, game designer and illustrator. He helped create gaming smash-hits like Apples to Apples and Munchkin, and has illustrated more than 100 other games and supplements. His comics include such acclaimed features as Dork Tower, Dr. Blink: Superhero Shrink, SnapDragons, and others. John was inducted into the Academy of Adventure Gaming Arts and Design Hall of Fame in 2003, the first cartoonist to receive such an honor. For more about John, visit http://www.dorktower.com. ©2013 Cryptozoic Entertainment. 16279 Laguna Canyon Road, Irvine, CA 92618. All Rights Reserved.